Google Nexus 5 release date, news and rumours | What Hi-Fi? UPDATE: The new Google Nexus 5 phone, built by LG, is expected to be launched in early November, looking to improve on the fine Nexus 4 (above), and take on the best Android smartphones around such as the HTC One and LG G2. 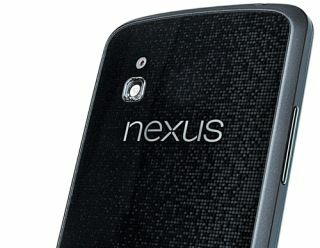 Hot on the heels of the new Nexus 7 tablet, Google could unveil its next flagship Nexus smartphone any day now, and it's expected to follow the Nexus 4 in delivering top-notch specs for a midrange price tag. We've rounded up the latest Nexus 5 rumours on the expected release date, price, features, specs and more. Another day, another rumoured release date for the Nexus 5 release. This time it comes with solid evidence to back it up. It appears a representative from LG has sent out an invite informing various media folk to keep the 5th of November free. The invite displays a Google Nexus 4 on a background of a broken Kit Kat finger, as well as a Kit Kat bar as a screensaver. The event however is taking place in Tel Aviv, in Israel, where Google do in fact have a campus. It's unclear whether this will be an official unveiling, or an information event for the people in the Middle East. However with a large 'LG' logo in the bottom left, there may well be some hardware news as well. Could we finally see the Nexus 5 unveiled alongside Android 4.4 Kit Kat? Previous rumours had suggested a November 1st release date for the Nexus 5, courtesy of prolific leaker evleaks. We shall see. We now have some solid evidence as to the pricing of the Nexus 5. The device appeared on the US Google Play store for $349 for a 16GB model. Whilst people weren't actually able to purchase the device, and it has since been taken down, it can give us a rough idea as to how much it will cost when shipped to the UK. When converted, $349 works out at around £215. It would be optimistic to assume this will be the UK price, so once associated costs are added on, it could come in at the rumoured £275 quoted below. TechRadar quotes a reliable source suggesting the Nexus 5 will be "half the price" of the latest iPhone 5s. If this proves true, that's around £275. This fits with the pricing of the Nexus 4, which was also far more affordable than the average headline-grabbing handset. It's possible the new Nexus could be a little more expensive than its predeccsor, with a likely screen upgrade accounting for much of this extra outlay, not to mention some other new featues and specs. Solid photo evidence purporting to be images of the Nexus 5 have been leaked by a user on Reddit, confirming suspicions as to what the device will look like. The user mentioned that the device had a premium feel, and felt more solid than the Samsung Galaxy S4. Along with the release date, evleaks also posted an image of a two-tone, black and white Nexus 5. The device looks identical to the one that was leaked on the Google Play store some time ago. A recent video release also gives us the most plausible evidence as to what we can expect when the Google Nexus 5 is held aloft at its unveiling. All recent rumours appear to have come to fruition; the 4.95in screen is there as is the rubber backing found on the Nexus 7. LG is once again the manufacturer of choice for the Nexus 5, with the phone taking design cues from the flagship LG G2, which is the first phone to support high-resolution audio. The latest images show what appear to be a 4.95in screen, and an incredibly narrow bezel. Other leaks also suggest the phone could have the same soft, rubbery backing as found on the Nexus 7. The Nexus 4 by contrast had a hard glass casing (and was extremely slippy as a result). The display should be a full HD 1080p resolution screen, an upgrade on the 1280 x 768 Nexus 4 screen. Android Police has managed to unearth some more concrete evidence on the Nexus 5, uncovering a supposed LG service manual for the phone, revealing drawings, design images and specifications. It confirms rumours that were already floating about, and appears to confirm pretty much the full Nexus 5 spec. There's a 4.95in screen, 1080p display, 16 and 32GB internal storage options, 2GB RAM, Qualcomm Snapgradon 800 processor at 2.3GHz, 8MP camera with OIS, 2300mAh battery and wireless charging. As well as a possible price being leaked when the Nexus 5 hit the US Google Play store, the home screen was also leaked. The Nexus 5 should be running Android 4.4 Kit Kat, with several new features on show, including a transparent notification bar, a less dense app drawer at 5 x 4 rather than 5 x 5 and improved Google Now intergration. Google Plus; Google's social network is now harder to steer clear from, most likely in a bid to gain more users. The gallery and messaging apps have been replaced by Google's own Google Photos and Hangouts respectively. The new software will bring a camera UI, with Instagram-style filters, better printer integration with the ability to save files to PDF, and a new payments system that will make better use of Google Wallet. The camera on the Nexus 5 has already been subject to much speculation. It will only be an 8MP affair, unlike the 13MP on offer with the LG G2, and have an aperture of f/2.4. However Google is rumoured to be introducing some new technology to their smartphone snapper. The Nexus 5 camera could be a MEMS camera; MEMS stands for micro electro mechanical sensor, and offers up to seven times faster focusing than most conventional cameras. It will also require less battery and produce less heat. It is also possible that it will allow users to re-focus their images after they've been taken, much like the Lytro camera. Google is expected to keep the wireless charging function found in the Nexus 4, using the Qi standard. This exhaustive spec, in a smart glass package and with Android 4.4, should make the Nexus 5 a pretty tempting package. But will it be enough to beat the best phones on the market? You probably won't have long to wait to find out the official Nexus 5 details. if you're looking for a high-end smartphone without the pocket-busting price tag, it could be for you. As ever, we'll be keeping this page updated with the latest news and rumours so keep checking back for more details.